Buying gold. It’s one of the key times to buy gold in the Hindus and Jains’ calendars and this year Askhaya Tritiya falls on the 28th April. Gold still remains – and always will be – important for Indian families because of its spiritual heritage. For many, buying gold in 2017 is becoming more attractive in a broader sense too. 1) Gold prices are closely linked to the US dollar. When the Dollar gets weaker it takes more dollars to buy the same commodity. When the currency becomes stronger, it takes fewer dollars to purchase any commodity that is priced in $USD. Although, it is still relatively early days for the new President, there are concerns over Trump’s growth agenda. Last week, there was a negative revision to Q1 2017 growth forecast because of falling retail sales. In New York, there were disappointing quarterly results from Goldman Sachs and Johnson & Johnson. 2) In India, there are expectations that The Reserve Bank Of India (RBI) is about to cut interest rates from 6.25%. As we’ve seen here, that should mean more cash in the pockets of consumers and therefore there should be more of an incentive to buy the precious metal. This would be welcomed by the Indian gold industry which held prices at a discounted rate in 2016. Last year was viewed as particularly difficult. 3) As we have already reported, there are increasing tensions globally, particularly in North Korea and Syria. Seoul is a key economic hub and is just miles from the North Korean border. A threat there would send ripples through the global financial markets and investors would certainly be looking at commodities such as gold to protect their assets. 4) There are also concerns about the outcome of the French election; the result could have a significant impact on global economies. This result could mean the yellow metal becomes attractive and used as a safe haven if far-right leader Marine Le Pen does become the next French President. 5) No one really knows what impact to either the UK or EU economies after Brexit will have. For those that may have forgotten, the then Chancellor, Alistair Darling said in September 2008 that people were just two hours away from not being able to withdraw their own money from UK banks. 6) Historically, gold has always performed successfully over time. If you take a look at the Krugerrand, you can see that average prices between April 2016 and April 2017 have increased. You can track historical gold prices here. Thinking of buying gold now for Askhaya Tritiya? Not sure where to buy gold? We’re one of the oldest bullion dealers in the UK and have helped Indian families since 1981 generate more through investing in the precious metal. We also offer secure storage at our vaults in the London Silver vaults, Chancery Lane. Our prices for both gold and storage are some of the lowest. Take a look at our wide range of gold now. We could also be reached by email: info@goldinvestments.co.uk | 020 7283 7752 | or instant messaging through our website. 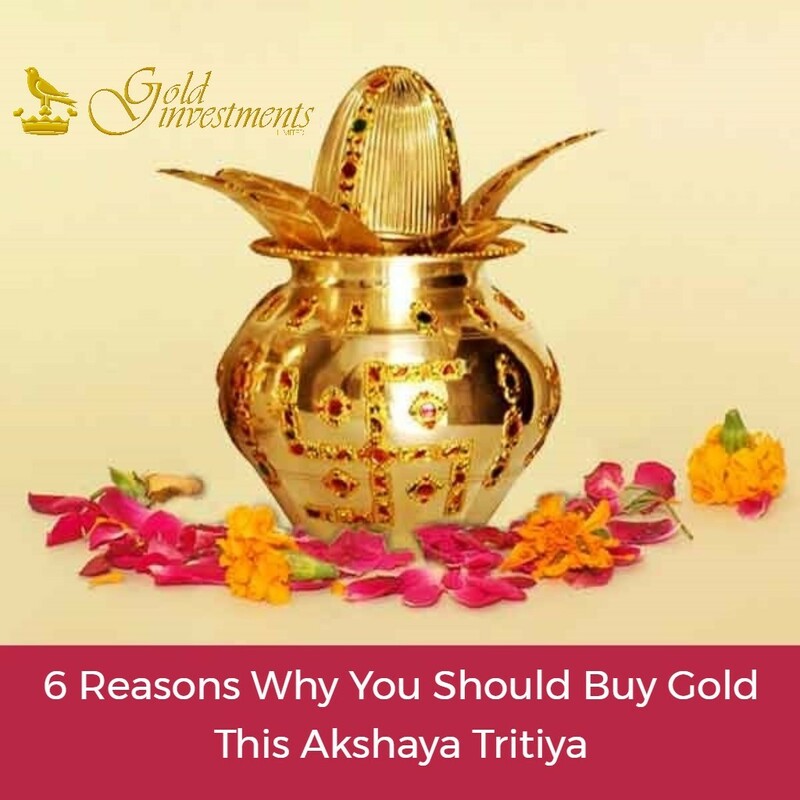 All the Gold Investments team send our best wishes to you for Akshaya Tritiya.